Born on 22nd July 1892, the first child of George and Elizabeth Funnell, the village bakers. He attended the village school until the age of thirteen when he began working alongside his parents learning the trade of the baker and delivering bread. Alfred was the eldest of nine children. He had five sisters, Lillian, Ethel, Evelyn, Ida and Kate who were three, seven, thirteen, fifteen and sixteen years younger than him respectively. He had three brothers, Robert, George William and Arthur who were six, nine and eleven years his junior respectively. He was eighteen in 1910 when the photograph above was taken. On 21st November 1914 Alfred went to a recruitment meeting in the village, signed up and went to France to serve his country in The Great War. On the 4th September 1916, aged 24, Lance Corporal Alfred Funnell of The 1st Battalion Norfolk Regiment died in the vicinity of Falefemont Farm near the village of Guillemont on the Somme in France. He has no known grave; he is remembered with honour on the Thiepval Memorial. 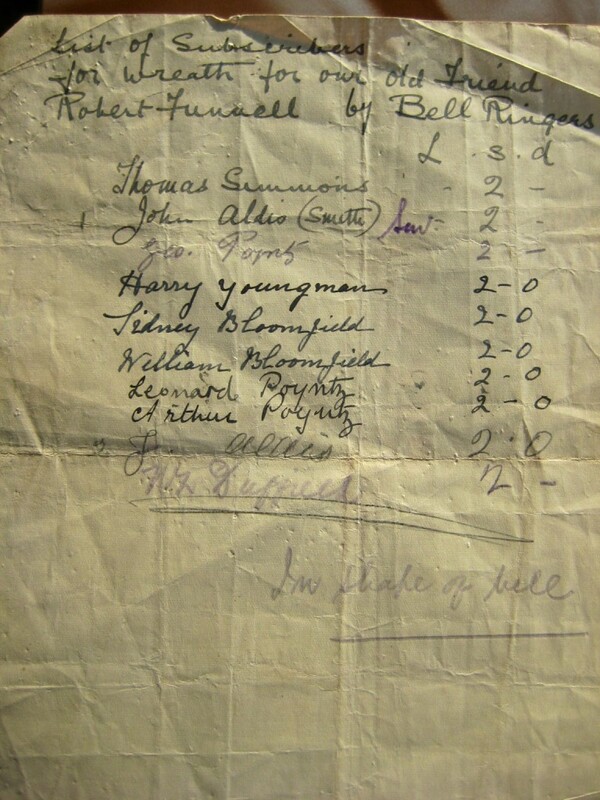 Alfred’s younger brother, Robert, was also a bell-ringer at St. Mary’s. In the 1901 Census his age was recorded as two. He enlisted as a Private in the Tank Corps in March 1917. Robert survived The Great War. Robert George Funnell died on 28th April 1935, aged 36. His fellow bell-ringers rang at his funeral and subscribed 2s each for a wreath in the shape of a bell. 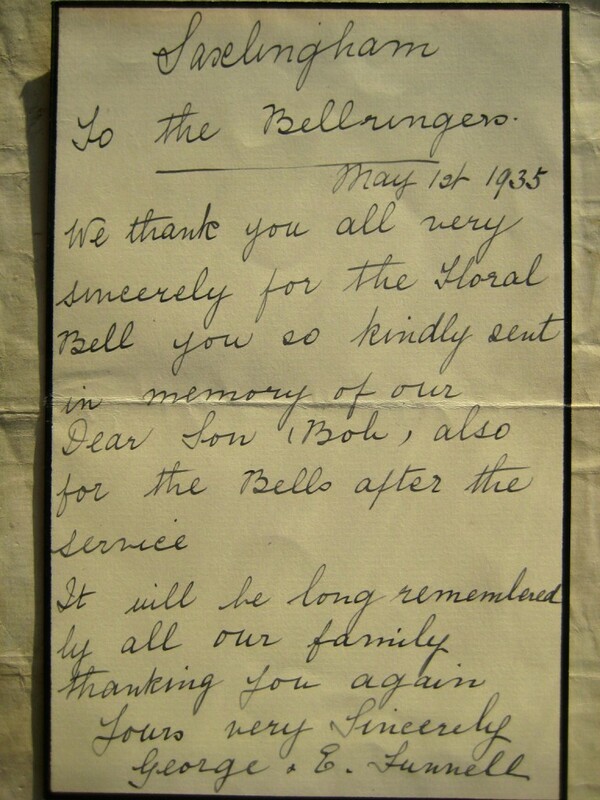 Robert’s parents wrote to the bell-ringers on 1st May 1935 expressing their thanks for both the floral tribute and the ringing. 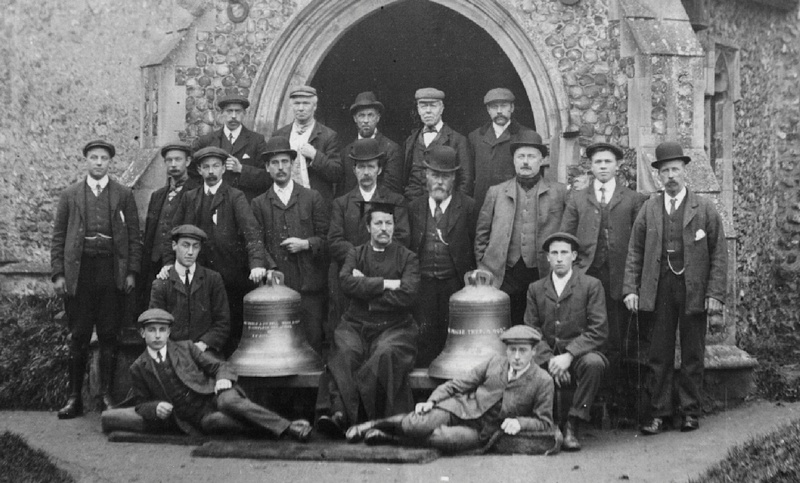 The St. Mary’s Bell-ringers in 1908 with the two new bells purchased by the Rev. Pitt (seated, centre). Alfred Funnel (aged ~16) is the young man lying on the left. 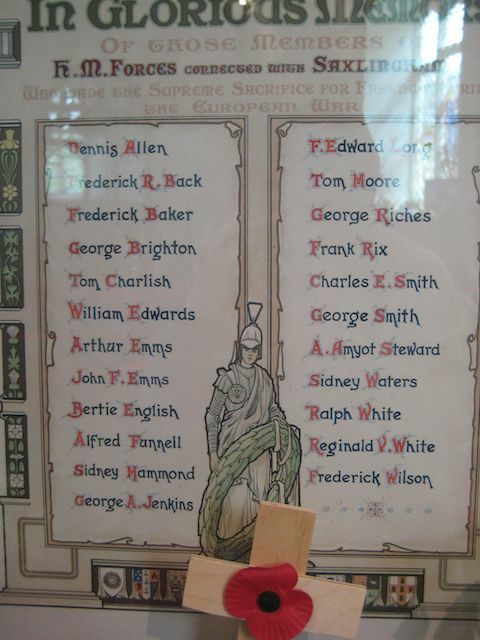 For more information on Alfred Funnell please visit the Saxlingham War Memorials website written and maintained by Jan Fox. Thank you for your comment and the link to the Central Council of Church Bell Ringers website. I wasn’t aware the Roll of Honour had been put online. It is a wonderful memorial to all those bell-ringers who have fallen in the service of our country through the years. No problem, I’ve sent an email to Alan Regin to make sure he is aware of this site too – he’s always after more information on the ringers named on the roll. He may well have a photo of Funnell’s name on the Thiepval Memorial. I didn’t think of it yesterday, but a couple named Pam and Ken Linge are building up a huge database on those commemorated at Thiepval (available in the visitor cemetery there). You can see various reports on it online, e.g. : http://www.thiepval.org.uk/stop_press.htm, http://www.greatwar.co.uk/organizations/thiepval-database-project.htm, http://www.telegraph.co.uk/news/uknews/8124065/Armistice-Day-on-the-trail-of-the-Missing.html and http://virtualexhibition.1418remembered.co.uk/zoom-on/the-missing-of-thiepval.html (contact details can be found in these reports). I’m sure they’d be pleased to have these details about Funnell. As part of my own reserach into the Surrey Association roll of honour (just going online at halfmuffled.wordpress.com) I’ve been going through the wartime issues of The Ringing World, building up a datbase of ringers mentioned in connection with service in the armed forces. No Saxlingham men found yet, but I’ll let you know if I come across anything.